Scandinavian Child Svan Signet Complete High Chairs - Free Shipping! This award-winning, beautiful Scandinavian-designed bentwood high chair grows with your child from infant to young adult. Starting as a traditional high chair, the Signet Complete High Chair can function safely with or without the tray to seat infants at the table. The safety guard can later be removed to allow preschoolers and toddlers to step up into the chair on their own. Once a child outgrows both high chair configurations, the Signet converts into a full-size chair for teens and adults. The Signet Complete High Chair comes with a removable tray that conveniently stores on the back of the chair and a dishwasher-safe, BPA and phthalate-free plastic tray cover. The Signet High Chair makes mealtime easy. Your baby can interact witht the family during meal times by bringing them directly up to the table. As your child grows, so does your chair - converting with them every step of the way. The striking bentwood design fits with any home decor - from the uber modern to the more traditional. The Signet complete high Chair is designed to grow with your child from 6 months to adulthood. It starts as a traditional high chair and functions safely without the tray to seat your child at the table. The safety guard can be removed to allow your child to step up into the chair on their own. Eventually, it becomes a full-size chair for a teen or even an adult! The removable five-point safety harness is designed specifically to allow the ergonomic seating of your child without inhibiting their interaction with the family at the table or ability to reach for food and activities. The only ergonomically designed high chair with a fully adjustable seat depth to provide optimum torso support. The seat and footrest heights are also adjustable to seat your child at the right height for your table and provide a foot rest at any age. Optional cushions are available as an additional purchase. A wide variety of colors and prints makes matching your décor easy. The Signet Complete High Chair was designed around the rigorous safety standards in Europe and is certified in the U.S. to meet the American Society for testing and Materials (ASTM) safety standards. These standards are developed by industry members, the U.S. Consumer groups, and other interested parties. Look for the gold JPMA certification seal. Your Signet Complete High Chair adjust easily with the provided Allen Keys. Why Tool? By using an Allen Key, you reduce the chance that a sibling or other person might adjust the chair in an unsafe manner or while it is in use with a child in place. The Signet Complete Chair has fewer places for food to hide. Simply wipe it down with a damp cloth. Every high chair comes with a removable plastic tray cover that is dishwasher safe. The optional Svan Cushion can easily be wiped off or machine washed and dried on delicates cycles. The Signet Complete Chair is made of bent Birch wood through an environmentally-friendly process. All materials used in the production of the Svan Chair, including the finish and glue, meet US Federal Regulations for safety and are not harmful to your child. The plastic tray cover is BPA and Phthalate-free. The optional Svan Chair cushions are PBDE-free. The Signet Complete High Chair is about the size of a typical kitchen chair. It is designed to sit up to a standard height table (30" high). Chair Base: 18" by 19"
Height to Top of Backrest: 33.5"
Height to Top of Safety Guard: 28.5"
Seat Height Range: 18.5" to 22"
Seat Depth (child): 6" to 9+"
Footrest Height Range: 5" to 17"
The Signet Complete High Chair is safety certified for average children up to 3 years old. As it adjusts, the Svan Chair can seat an adult up to 250 pounds in the adult position. We are excited to announce that the enhancement of the brand starts now with our new Svan Chair ? the Signet. Signet is a fitting name for this graceful Scandinavian design high chair as ?cygnet? is a baby swan and the chair designer's signature adorns this new model chair. How is the Signet different from the original Svan High Chair? The Signet Chair affords your little one the opportunity to join the family for meals at the table. As a more traditional high chair, the Signet Complete (6 months to adult) functions safely with or without a tray to seat infants as young as six months at the dinner table. The Signet (2 years to adult) is designed for that next stage in life, allowing toddlers and preschoolers to step up into the chair and seat themselves. Expecting a new baby in the house? 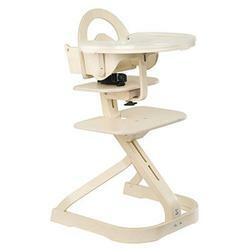 The Signet can easily be turned into a Complete high chair for infants with wooden tray, plastic tray cover and guard. The Signet High chairs are great investments as they grow with a child and can be eventually converted into a full-size chair for young adults. What makes this attractive chair even more attractive? A better price point of course! Now for just $249.95, you can have an awardwinning, bentwood, designer high chair that grows with their child from infant to young adult. With improved labeling, clearly marked adjustment points, and redesigned components, the Signet Chair is easier to assemble and adjust as a child grows. All Signet High Chairs come with a 5-point safety harness, helping to keep even the most active children safely seated. The Signet is more than a high chair ? it's a work of art! Its beautiful Scandinavian bentwood design sets it apart from its competitors. The chair's designer, Kjell Hagstöm, was so excited about the updates to the chair that his signature now adorns these chairs, distinguishing these fashionable, functional high chairs as pieces of the new Svan "Signeture" collection.